‘In the South Africa war we wanted men who could shoot and could ride horses; in this European war we want men who can shoot and ride bicycles, the Mechanical M.I’. 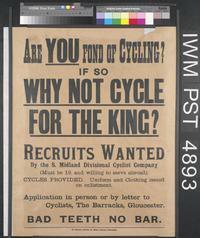 ‘primarily the cyclist is an infantryman, a trained solder mounted on an iron-clad steed that moves on at an easy twelve miles an hour and requires no feeding or watering, no veterinary attendance, and no two days to four days rest’. Clark here picked out iron-clad as another new use, especially in this applied sense. It meant a cycle, as his annotations explained. Like war in the air, accounts of the military engagements – and utility – of the cyclist troops could, also prove remarkably partisan. A report from a cyclist officer which appeared in the Daily Express on 1st September 1914 (in a clipping included in Clark’s first notebook) noted, for example, that ‘the cyclist troops of the Allies have already been in action and the new arm, the “mechanical mounted infantry,” even at this early stage of the great war, has “made good”’. As it added in further commendation: ‘it may almost be said to have scored a triumph’. For Clark, this neatly provided a trio of interesting forms, none of which had –or indeed have since — made their way into the OED. The use of cycles by the enemy could, however, attract comment which was more critical – even if, from Clark’s point of view, it was equally useful in demonstrating the introduction and use of words. ‘It is really a comic idea to send a cyclist-detachment into Russia’, as the Daily Express – perhaps with some reason – recorded on Saturday 5th September 1914. ‘127 cyclists had been taken prisoner’, it reported: ’three squadrons of German cavalry, supported by a company of cyclists, were cut up by Russians’. The ‘poor cyclists have a very bad time on the Russian roads’, it stated in apparent sympathy. As in other respects, Clark’s record of words in time can here vividly remind us of certain aspects of history which have perhaps faded in popular memory (as well as of combinatory forms which dictionaries such as the OED do not record). As history itself proved, however, the use of cycles as an active force in war – viewed with optimism in these opening weeks — would be equally subject to change and obsolescence as positions became entrenched, and a very different style of war came to the fore.